Every now and again I am struck in the forehead with the idea for a dish; this one came to me while stuck in traffic on Highway 50, two years ago. I dubbed the dish “Oyster, Oyster, Oyster,” and immediately set about making it. It’s taken me forever to perfect it, but finally I have something I would be proud to serve anyone. The genesis of “Oyster, Oyster, Oyster” comes from my habit of growing odd vegetables, things many of my fellow gardeners have either considered useless or have never even heard about. It’s like the old saying about the produce aisle, where you’re supposed to buy one thing each week you’ve never eaten before — only my produce aisle is, for the most part, either the natural world around me, or my garden. That’s how I came to plant scorzonera. Never heard of scorzonera? It’s like salsify, only with black skin. Still not helpful? How about its other name, oyster plant? Still nothing? No worries, it’s not the most popular plant in the produce section. That is a shame. Having now eaten it, I can say the world is less of a place because we eat so little oyster plant — and that oyster plant is less of a vegetable, at least in most people’s eyes, because of the dolt who named it such. Whoever he was ought to be punched dead in the face. Think on it. “Hey Holly, want some oyster plant?” What would you say? That I want to eat a plant that tastes like an oyster? Or worse, eat a plant with the consistency of an oyster? Fer chrissakes, who the hell in his right mind would ever want to put something like that in his mouth? I can fix it: I now christen this skinny, homely root “Artichoke Heart Plant.” There. It’s done. I have waved my magic wand, drawn the pentagram, given alms to the saints and sacrificed the goat. Why the new name? Because scorzonera, salsify or whatever, really tastes far more like an artichoke heart than anything else I have ever eaten. Other than artichoke hearts, that is. If you like artichoke hearts, seek out salsify. Or scorzonera. Or oyster plant. And when you find or grow some, there are any number of things to do with it. I decided to boil the roots with a few potatoes, mash them with butter, milk and thyme, then roll the mash in egg and panko breadcrumbs and call it a croquette. Salsify croquettes rock. I could have eaten three of them. Light, creamy, and full of salsify goodness. Or is that Artichoke Heart Plant goodness? You decide. My original dish also had oyster mushrooms and a weird greenish sauce made from pureed oysters. Thus, “Oyster, Oyster, Oyster.” It tasted good, but it was ugly. Really ugly. This presentation just didn’t do justice to the concept of the dish I had in my head. It was close, but needed a lot of work. One of my problems with the initial dish was the actual oysters: They were huge, too big to place on top of the croquette. And I tried to pickle them, but that made things worse. They tasted like giant, acidic globs of snot. That’s why I buzzed them in a blender. The surprise was that they actually tasted good as a sauce. So, for the redux I decided to make everything smaller. 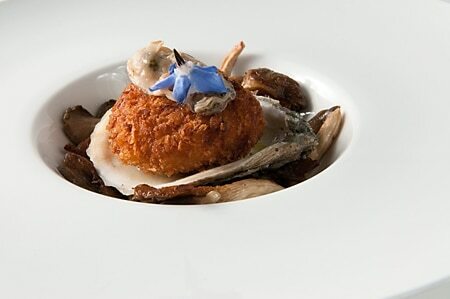 Smaller croquette, smaller oyster mushrooms, smaller oyster. If you don’t like the idea, blame Thomas Keller, whose philosophy that a dish ought to only have a couple of bites — any more and your palate gets fatigued — has taken a hold of me in recent years. 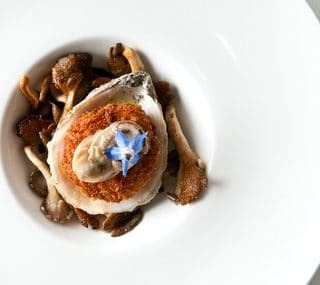 The seared oyster mushrooms serve as a bed for the oyster shell that holds everything else; without a bed of some sort, the shell will teeter on the plate. I then gently poached a small oyster in butter to top the croquette. A single borage flower adds some needed color and, if you concentrate while eating it, you will pick up its cucumber-like flavor. I think it’s one of the most beautiful dishes I’ve ever come up with, and, so far as I know, it is original — a rare thing these days. As fancy as this dish looks, really the hardest part of it is finding the salsify: You can find it in specialty groceries in fall through spring. Scorzonera is a black-skinned variety. You can also buy salsify seeds and grow your own. There is no real substitute if you want to really have the three "oysters" in the dish, but a mashed potato croquette will look and taste fine. Use small oysters and small oyster mushrooms here, if you can. This is supposed to be an appetizer, or one course in a many-coursed meal. Scrub the oyster shells well with a brush to remove all grit and dirt. Squeeze the lemon into a large bowl of cold water, and bring a pot of salted water to a boil. Peel the salsify (oyster plant, scorzon…you know what I mean…) one at a time and put each root into the water. When you’re done, cut each root into short discs and put into the boiling water. Peel the potatoes, cut into pieces roughly the same size as the oyster plant and add them to the boiling water — this method ensures that both are soft at about the same time. Boil both veggies for 30 minutes or so; the salsify will take longer to soften than the potatoes. Meanwhile, shuck the oysters over a bowl, letting the juice fall into the bowl. Set the oysters in a small bowl in the fridge. Strain the oyster juice through a paper towel into a small pot. Add 5 tablespoons of butter to the pot and melt over low heat. When the salsify and potatoes are ready, mash with 1 tablespoon butter, thyme and a little of the milk or cream: You want the mash to be pretty solid, not super smooth or wet. Form the mashed salsify and potatoes into small discs. Dip into the beaten egg and then into the panko bread crumbs (you really do want panko breadcrumbs, which are very coarse; it’s a texture thing.) and be gentle, as this is not a very solid mass. Get enough oil to reach up about 1/2 of an inch up the sides of a frying pan, and begin heating it to 350 degrees. You'll know the oil is hot enough when a pinch of flour sizzles immediately. Slide the croquettes gently into the hot oil. Fry until golden brown, about 2 minutes, then flip and cook the other side. When they’re all a lovely golden brown, drain the croquettes on a rack. Heat another saute pan over high heat for 1 minute, then add the oyster mushrooms. Shake the pan constantly so the mushrooms don't stick until they sizzle and begin to release their water. Sprinkle salt over the mushrooms. When most of the water is gone, add the remaining butter and saute until the mushrooms begin to brown. When they are nicely browned, turn off the heat. Turn the heat back onto the melted butter-oyster juice pot. When it begins to sizzle, turn off the heat and slip in the oysters. Remove after 1-2 minutes, or when the edges curl. Salt them lightly. 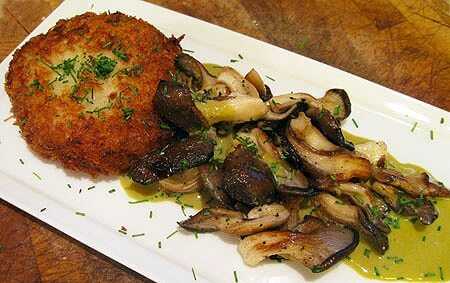 To serve, place some oyster mushrooms down on the plate, then top with the clean bottom part of the oyster shell. 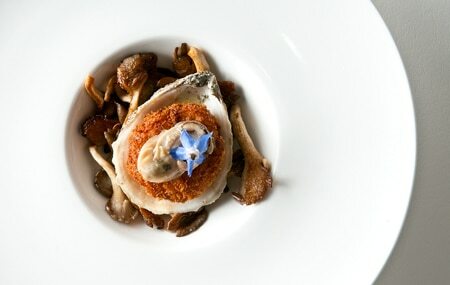 Put the croquette in the shell, then top with the poached oyster and finally with a single borage flower. having never had the oyster plant, I am nonetheless sure that I would love this. Fried goodness, mushrooms and oysters? Count me in! Very nice. I have wanted to try oyster plant for some time. I love oysters, and artichokes too for that matter. And now I have a great recipe to try. Thanks! Neat concept w/the three oysters. I didn’t realize salsify has such a flavor, both of which I like. I hope to find it (out in nature or in a grocery store) some day.